I’m as into adrenaline rushes as they come. The fact that I had never been jet boating before arriving in Livingstone had nothing to do with the will to do it, and everything to do with the fact that I just hadn’t been able to afford to do it before. At Iguazu Falls, I had to opt out of the jet boat trip under the falls simply because I couldn’t afford it. I’d be lying if I didn’t look down on those boats with envy when I was there. 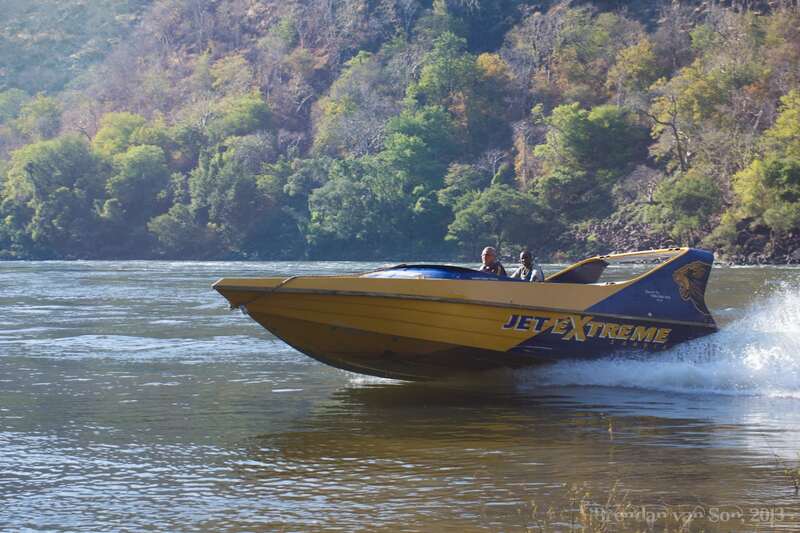 However, I was stoked when Jet Extreme in Livingstone offered to take me out on the Zambezi River. The trip was some seriously insane fun, and actually much more intense than I imagined. The boat flies down the river at top speeds and then the driver can whip it to a turning stop on a dime. We cruised over some of the rapids that the rafters go down on the Zambezi, and cut along some spectacular scenery. I was drenched by the end of the trip, but every inch of my smile was on full display. It really was an amazing time and a trip I highly recommend if you’re ever in Livingstone, Zambia. Wow, but this looks like fun. I’ve never had the opportunity, but this activity has certainly moved higher up the bucket list! An awesome adventure. And I’ll bet rafting it would be fun too. The rafting there is meant to be the best in the world. I didn’t get to because the water was too high though. Jet boating in Zambia sounds like the coolest thing ever. Too bad they didn’t let you jump behind the wheel. Damn rights, that would be amazing.